Beyond the Ordinary | Interview with Diane McCann by Angela Counsel, Healthy, Wealthy & Wise in Business Podcast Interview. Growing your Business with your Goddess Superpowers! 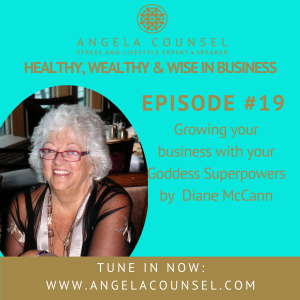 On this episode of Healthy, Wealthy and Wise we meet the wonderful Diane McCann! Qualified in multiple disciplines including kinesiology, EFT and the Lifeline technique, along with years of corporate experience, Diane knows how to bring the spiritual world and the “real world” together.In fact, Diane is responsible for introducing re-birthing into South Australia’s prisons, with dramatic results achieved among the inmates she worked with. Diane’s message to all of us is that we can be whoever we want to be, and create lives and businesses that reflect who we are as individuals. She believes in the importance of self-worth, of knowing that we are all enough; of working on ourselves so we can arrive at a place of authenticity; and that world peace is possible. Remember, problems are portals!